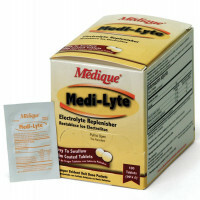 Electrolytes, which can be found in some sports drinks, are compounds ideal for avoiding side effects associated with exorbitant perspiration. 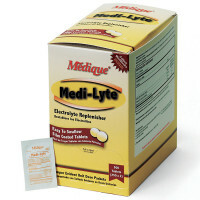 Our Electrolyte Tablets will aid in the prevention of fatigue, muscle cramps, and heat exhaustion during such excessive sweating. For convenience, each packet contains a single-dose of two tablets, and we carry a pill keychain for on-the-go readiness.